Always skate within your ability. If you don’t know how to skate, come to our skating classes. If you haven’t skated in awhile, take it slow and easy. Don’t try to skate too fast or do fancy tricks. Check your skates before skating. See your local skating center for tips on how to check your skates for safety. Skate at a safe and comfortable speeds, avoid dangerous pranks and games. Watch where you skate! When skating indoors, keep in mind that others have varying abilities of expertise. Skating into people can cause serious injury. Practice falling! Most injuries occur because skaters don’t know how to fall properly. Skating lessons teach you how to fall safely. Buy high-quality skates. They will withstand wear and tear, and are less likely to fall apart and cause injury. Wear full protective gear. (helmets, knee and elbow pads and wrist protectors) when skating outdoors. 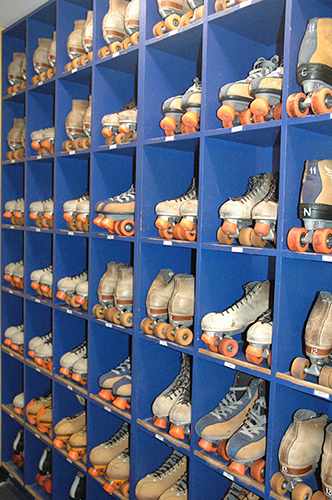 The gear is optional when skating indoors at a skating center because risk of injury is slightly reduced due in part to the skating surface being smooth and well maintained and because discipline is enforced. When skating outdoors, obey all traffic and safety rules and be courteous to pedestrians. Skate at a Roller Skating Association (RSA) International skating rink. RSA International facilities adhere to safety standards and maintain their skating centers.